Anime adaptations have had a rough time in Hollywood. The first two attempts, Speed Racer and Dragonball Evolution , were critical and box office failures. The Ghost in the Shell franchise, however, has some of the trappings of a successful live-action film: adult characters, sophisticated themes, and lots of stylized action. Its adaptation seemed poised to be anime's first Hollywood success story. With the news that Ghost only made $60 million of its $110 million budget in its opening weekend, finishing in third place behind The Boss Baby ( BOSS BABY !) and Beauty and the Beast , it seems like those hopes have been dashed. On top of all that, the film isn't even very good. In the near future, widespread cybernetic implants have greatly enhanced human capabilities. Major Mira Killian nearly died in a terrorist attack as a child, only for Hanka Robotics to save her brain and place it in a fully robotic body or "shell" (the titular "ghost" being her mind itself). Motivated by her experience with terrorism, she now serves as a member of anti-terror task force Section 9. When the Major and her squad face off against a terrorist targeting Hanka Robotics scientists, their investigation leads to a series of revelations about her past. 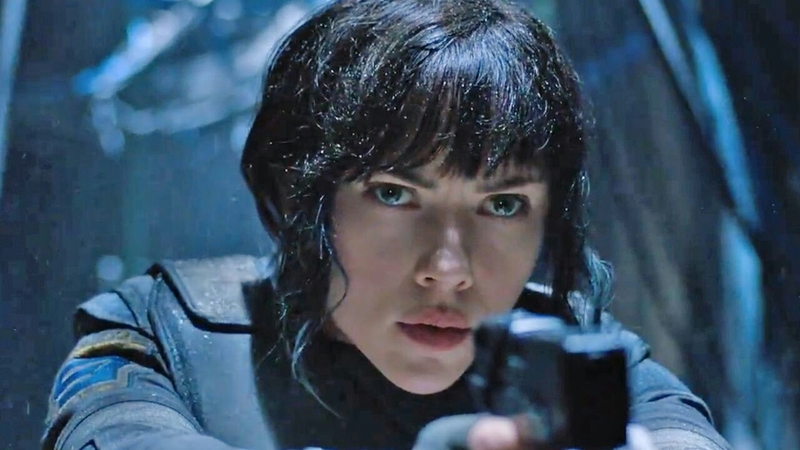 It would be foolish to skirt around Scarlett Johansson's casting as Mira, the Character Formerly Known as Motoko Kusanagi; not only was it a controversial choice among Asian-American filmgoers and fans of the original story, but the film itself addresses the controversy within its own canon. I'll concede that the Major, despite her Japanese name, need not by definition be played by an Asian actress; the character's body can look like anything at all. But in an age when Hollywood still fails to cast Asian actors in lead roles, to pass up this clear opportunity to cast an Asian actor in an Asian property is irresponsible. Though Masamune Shirow's Ghost in the Shell manga and its anime versions hardly grapple with race, the franchise is, in fact, quite political. Wrapped around the police procedural format of Ghost in the Shell is an interrogation of the ramifications of cybernetics on geopolitics, the economy, and the criminal justice system. Director Mamoru Oshii's first film — the obvious template for Rupert Sanders's Hollywood version — begins as a detective story but also poses questions of legality and identity. Can an AI demand diplomatic immunity? When your body and mind are hackable, customizable systems, what makes you "you"? The live-action film, by contrast, grossly simplifies things, and seems far more concerned with presenting digestible platitudes than grappling with ambiguous ethical quandaries. I expect deviations and simplifications in an adaptation, but the movie isn't even effective at what it sets out to do! The very first scene lays bare the entire dialectic: Hanka is experimenting on humans for profit, which is Very Bad. This sets up a film that should focus on the Major's shaky sense of identity and history with Hanka, but instead director Rupert Sanders ( Snow White and the Huntsman ) spends an inordinate amount of time aping specific scenes from the original anime: the spider tank fight, the scuba diving scene, the hacked garbageman. The Major's famous jump off of the building even occurs TWICE! Severed from their original context, these iconic moments become mere visual accents, and often lack any thematic resonance with the rest of the film. Like the references to the original, the members of Section 9 mostly feel like window dressing. Pilou Asbæk plays Batou, the Major's gruff sidekick, and Japanese legend "Beat" Takeshi Kitano plays Section 9's chief Aramaki, who speaks subtitled Japanese for the entire movie. The rest of them — Togusa, Ishikawa, Saito, Borma, and new character Ladriya (presumably a female replacement for Paz) — barely get any screen time or character development. Even when the action calms down enough to develop the relationships between the Batou, Aramaki, the Major, and her Hanka handlers, it's mostly communicated via dialogue that bluntly reiterates the film's themes. On top of that, Johansson and Kitano both deliver sleepy performances. There's a clear effort to contrast the Major's emotional turbulence and robotic efficiency, but a ham-fisted script and wooden acting from Johansson place her at a bland midpoint between cold-hearted cop and troubled ingénue. 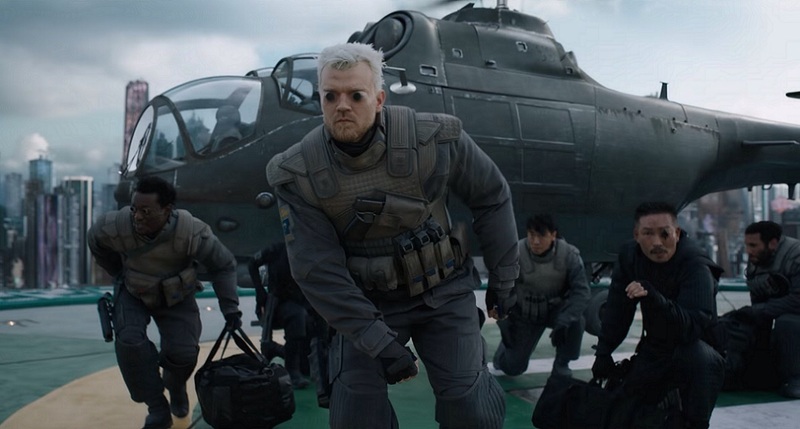 Unsurprisingly for fans of the original, Batou is heart of the film; in his exchanges with Johansson, Asbæk sells him as a soldier whose hard edges belie a certain human tenderness, and it's a shame the film doesn't give him and the screenwriters more time to explore the character. The action scenes are readable but rarely all that exciting or creative. Many of the fight scenes are either focused on showcasing set pieces or imitating the anime rather than establishing characterization or themes. Despite his reputation for being a badass, Kitano sits in a chair for most of the movie, only to completely steal the show when he finally sees combat for roughly two minutes at the end of the film. 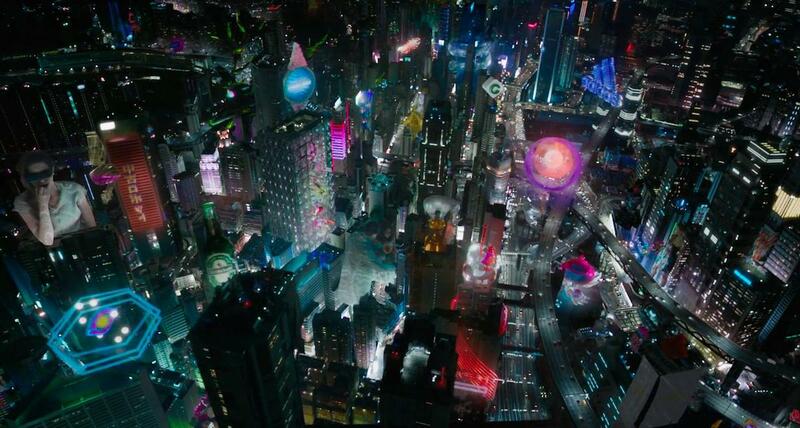 The movie has at least gotten a lot of praise for its visuals, though the holographic projections and bright clothes that blanket the city often feel a little too amped up — more Speed Racer than Blade Runner. The irony is that, despite anime's reputation for flashiness, the Ghost in the Shell franchise has always featured a fairly muted color palette. The rest of the movie strikes a nice balance between sleek futurism and realistic industrial utility that closely mirrors the anime and manga designs. If nothing else, there is something kind of cool about seeing these iconic characters and mechanical designs recreated in a big-budget Hollywood movie. And then there's the moment that Ghost in the Shell will surely be remembered for: a baffling attempt at an in-canon explanation for why a historically Asian character is played by a white actress. Like most of the story beats, it won't come as much of a surprise, but the intensely awkward sequence unfolds like a train crash in slow motion. The filmmakers would have been better off accepting Johansson's casting rather than trying to cover their asses. As an adaptation, Ghost in the Shell fails miserably, mangling the themes of the original in order to accommodate Hollywood's assumption that Americans are too stupid for complex stories. But even on its own terms, the movie is a visually arresting but ultimately empty package that offers only the most facile critiques of its own technological society. At least there's a basset hound in it.